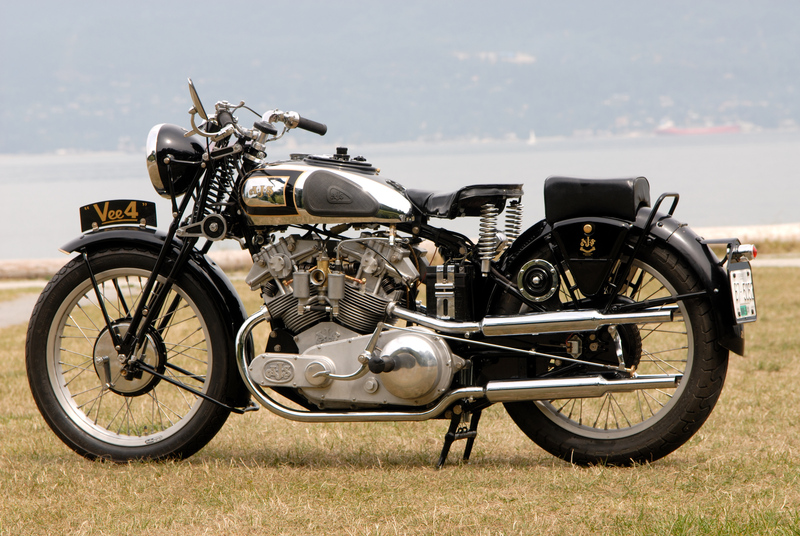 Resurrecting The Mighty AJS V4 From 1936 - Dr Wong - Emporium of Tings. Web Magazine. 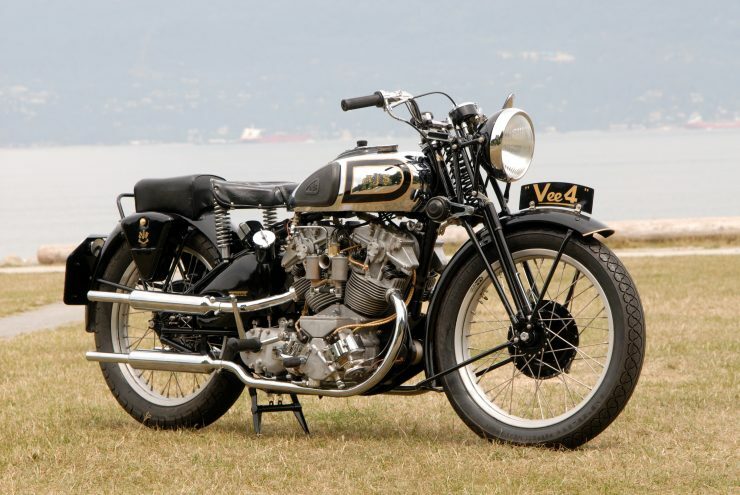 The AJS V4 was an advanced engineering effort undertaken by the British motorcycle company in the mid-1930s, the first prototype was intended as a road-going motorcycle and it was shown at the Olympia Show in 1935. The road-going version of the V4 didn’t get a green light for production, it’s not known why exactly but it likely had something to do with the fact that it would have been exceedingly expensive, and the world was still very much in the grips of the austerity period of the Great Depression. 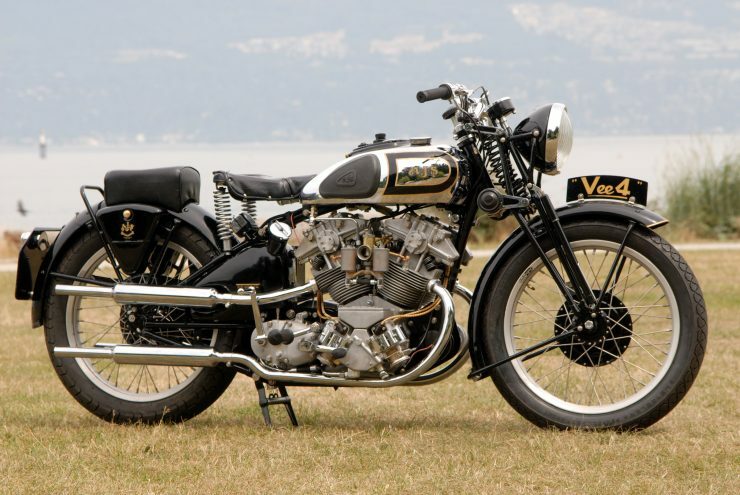 In 1936 a new racing version of the AJS V4 was unveiled, it had alloy barrels and individual heads with exposed hairpin valve springs, a common crankcase, a 180° crankshaft with forked conrods, a single overhead cam per cylinder, a Zoller supercharger, an Amal TT carburetor, and a 5-speed Burman transmission. 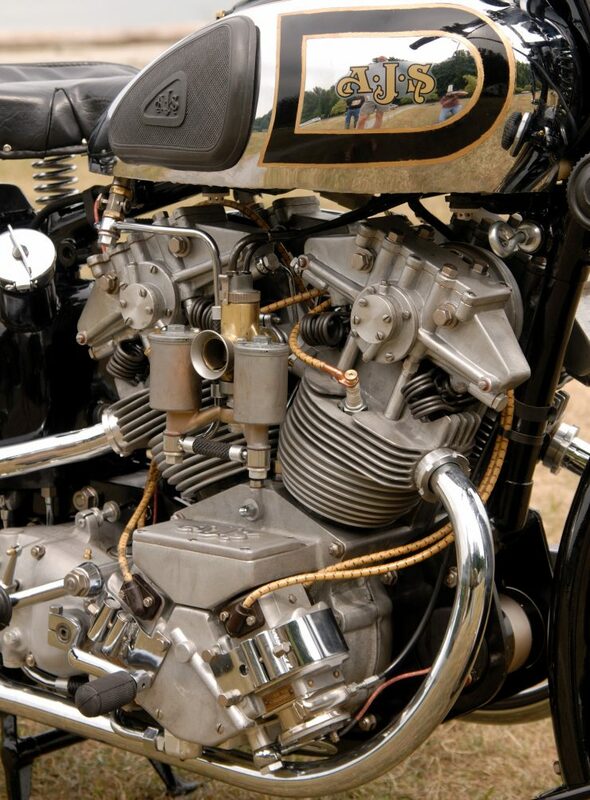 The bike showed much promise but its engine was complex, and it suffered from a lack of development time. 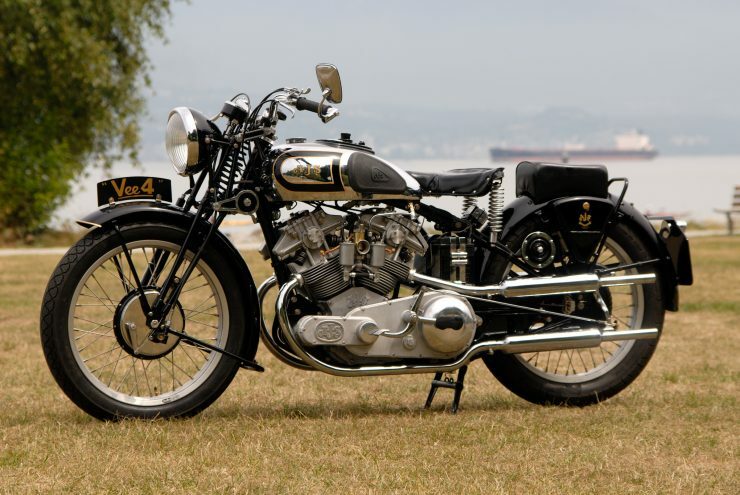 AJS sent the bike to the 1936 Isle of Man Senior TT but although it was very quick, it was unreliable, and suffered mechanical failures. 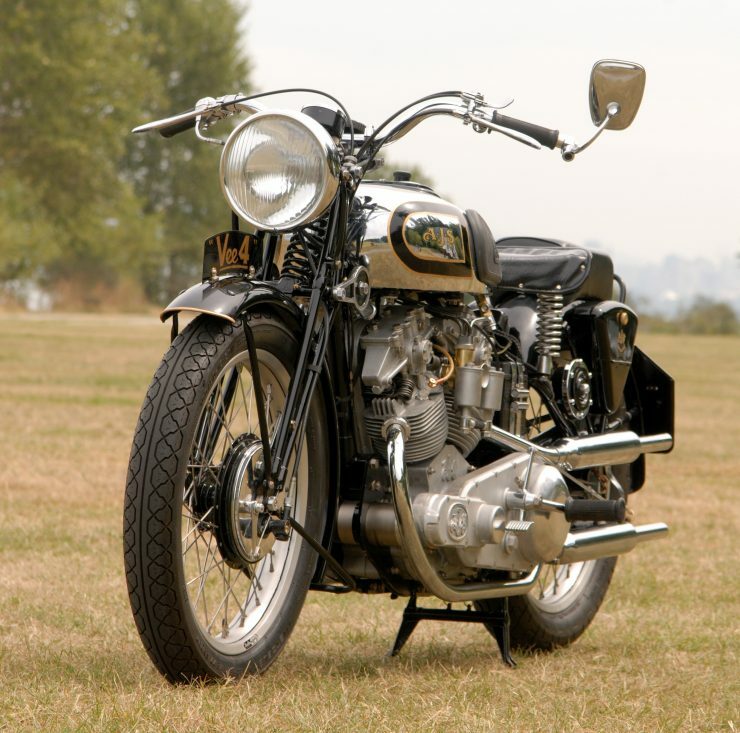 A rebuilt version appeared in 1938 that had been considerably redesigned with better suspension, brakes, and some engine modifications. This new version was sent to compete in the 1938 Senior Isle of Man TT but suffered overheating issues and retired – this all but ended the air-cooled version of the AJS V4, but the story doesn’t quite end there. Rather than give up, AJS brought in Matt Wright from New Imperial to do a blank-slate redesign. The new engine was liquid-cooled with barrels and heads cast in pairs, fully enclosed valves and springs, and a slew of other improvements to help with reliability and overheating. 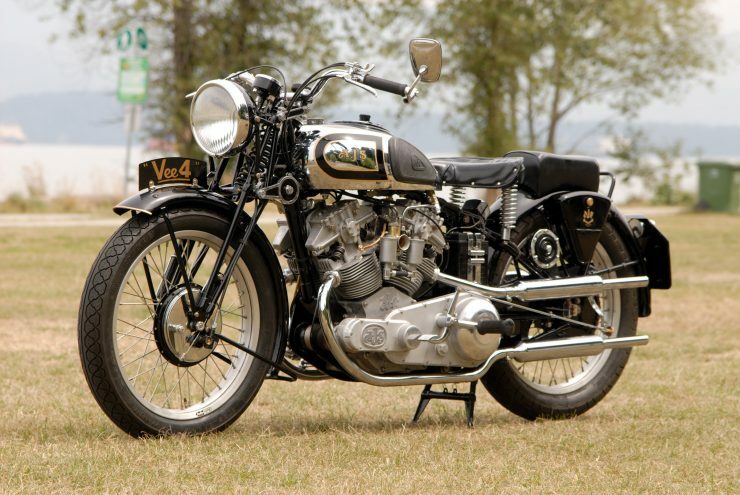 This new AJS V4 proved competitive, in the 1939 Ulster GP two examples of the V4 led from the start – both would retire but neither failure was a mechanical engine failure (a spark plug and broken suspension). It was during this race that rider Walter Rusk completed the first lap at a record breaking average speed around the course of 100.03 mph. The first and only win to be enjoyed by the V4 was at the 1946 Chimay in Belgium with rider Jock M West in the saddle. 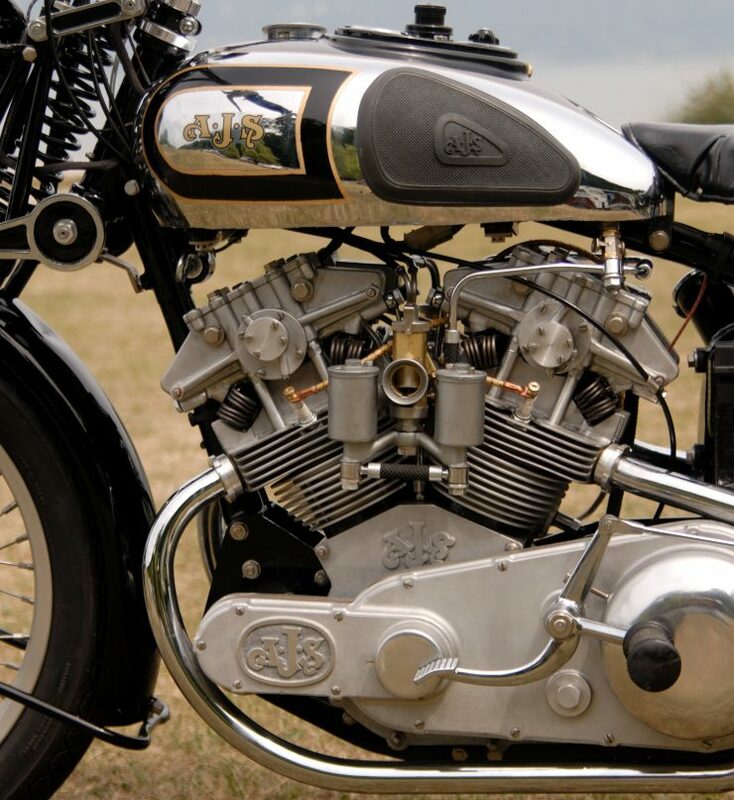 Once forced induction was banned the AJS V4 became obsolete overnight, so the company shifted focus to other models and the V4 was no more – or so the world thought. 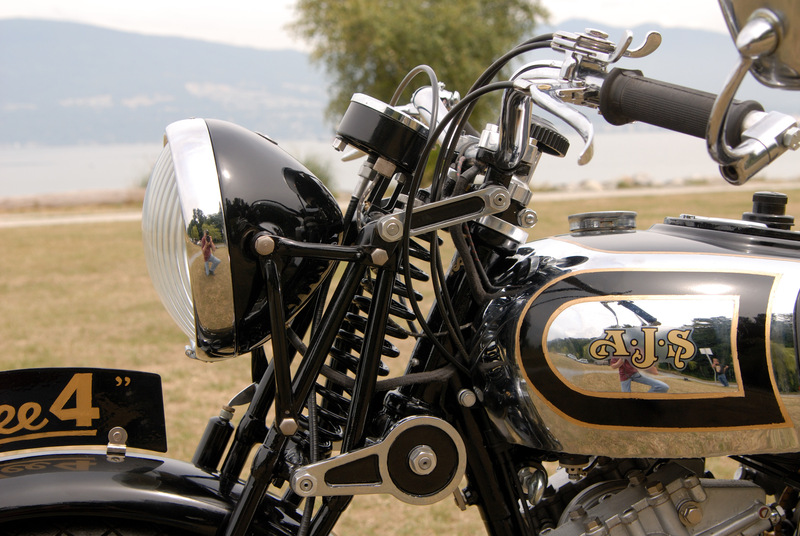 Vancouver resident Dan Smith is a machinist and a man deeply familiar with British muscle bikes – he owns a Vincent Black Shadow and a Vincent Series B Rapide which he rode all the way down to Tierra del Fuego and north into the Yukon territory. Dan stumbled across an old engine drawing of the V4’s internals and did a little more research, uncovering a series of photographs and history on the famously advanced engine from before the Second World War. Despite the original engine’s reputation for reliability, Dan rolled up his sleeves and set about building an entirely new AJS V4 from scratch. 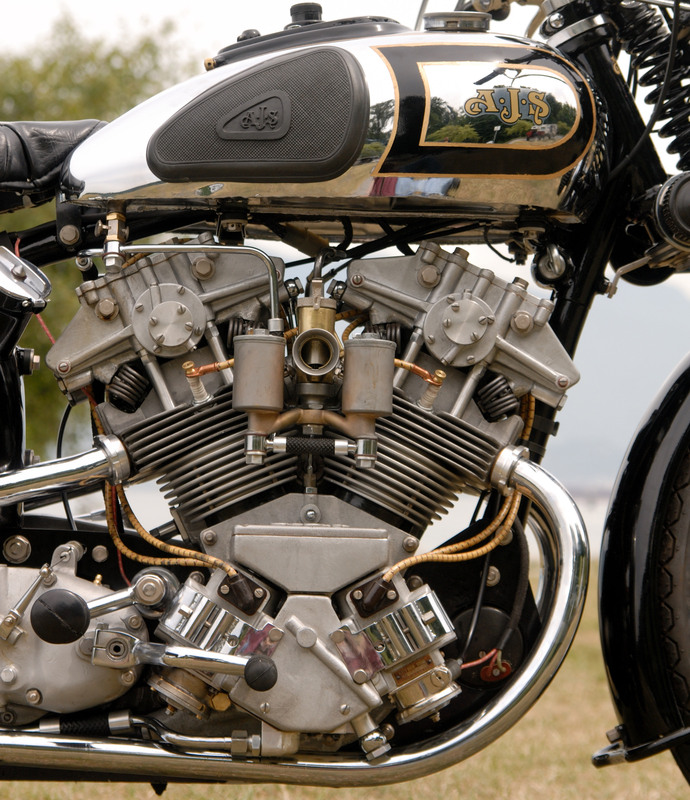 The project took him years and resulted in an engine with bespoke cast, machined, and fabricated parts throughout including staggeringly complex items like crankshafts, crankcases, and heads. The complete story of the build process is a fascinating read, it was documented in great detail by the team at Canadian Biker Magazine and you can read about it here. Now complete and fully run-in, the Dan Smith AJS V4 is being offered for sale. If you’d like to read more about it or register to bid you can click here to visit Mecum. The post Resurrecting The Mighty AJS V4 From 1936 appeared first on Silodrome.